Unix (/ˈjuː.nɪks/; trademarked as UNIX) is a family of multitasking, multiuser computer operating systems that derive from the original AT&T Unix, developed starting in the 1970s at the Bell Labs research center by Ken Thompson, Dennis Ritchie, and others. Initially intended for use inside the Bell System, AT&T licensed Unix to outside parties from the late 1970s, leading to a variety of both academic and commercial variants of Unix from vendors such as the University of California, Berkeley (BSD), Microsoft (Xenix), IBM (AIX) and Sun Microsystems (Solaris). AT&T finally sold its rights in Unix to Novell in the early 1990s, which then sold its Unix business to the Santa Cruz Operation (SCO) in 1995, but the UNIX trademark passed to the industry standards consortium The Open Group, which allows the use of the mark for certified operating systems compliant with the Single UNIX Specification (SUS). Among these is Apple's macOS, which is the Unix version with the largest installed base as of 2014. From the power user's or programmer's perspective, Unix systems are characterized by a modular design that is sometimes called the "Unix philosophy", meaning that the operating system provides a set of simple tools that each perform a limited, well-defined function, with a unified filesystem as the main means of communication and a shell scripting and command language to combine the tools to perform complex workflows. Aside from the modular design, Unix also distinguishes itself from its predecessors as the first portable operating system: almost the entire operating system is written in the C programming language that allowed Unix to reach numerous platforms. 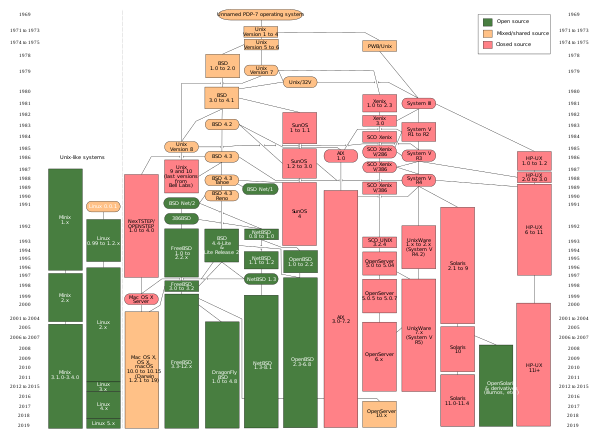 Many Unix-like operating systems have arisen over the years, of which GNU/Linux is the most popular, having displaced SUS-certified Unix on many server platforms since its inception in the early 1990s.